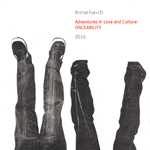 At Silber we’re pretty excited about Adventures In Love and Culture: ONCEABILITY because it is conceptually pretty much everything we’re all about, especially with the 5in5 series. Two artists living a couple thousand miles away from each other who've never met in person with very different approaches to music meet through a release on Silber (LD’s 5in5 from last year - The Just-World Phenomenon) & end up working on a release on Silber. Pushing each other out of their comfort zones to make something neither would do alone. Electronics & chaos from Bronze Eye & crafted poetic lyrical precision from LD. A soundtrack to a dream where two worlds collide like a medieval minstrel busking on a space station.